White fighters are the units of the white faction. They fight against the black fighters. Vs. Black fighters are the units of the black faction. They fight against the white fighters. White cruisers send fighters in order to defeat the adverse fleet. 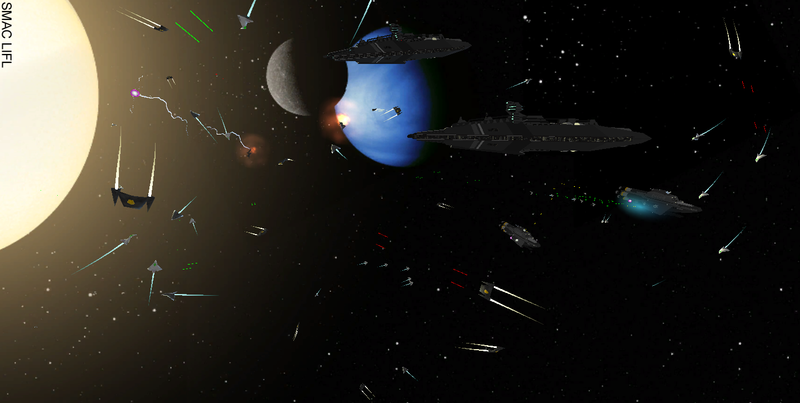 Black cruisers send fighters in order to defeat the adverse fleet. White fighters can regroup into squads and lead raids against black frigates. Frigates back up the black fighters. They fight back the white squads' raids. IODA was designed and developed by the SMAC team at CRIStAL, Lille, France. IODA is a multiagent methodology whose goal is to ease the involvment of non-computer scientists in the participatory design of a simulation. To that end, IODA advocates for a few recommendations and is bundled with several implementation tools like JEDI (a Java implementation of IODA) and IODA-Unity (which was used for this project). IODA's basic principles are detailed below. The image on the right depicts the "perception graph" of the simulation. It shows that every agent are not omniscient but only aware of the other agents in their local neighborhood. The behaviour of each agent in the simulation is defined by the set of elementary interactions they can trigger or undergo. An interaction is defined between a source agent and a target agent. It is triggered when preconditions are met and provided a limit distance between the two agents is matched. The model of the simulation is represented by the interaction matrix, summarising all the interactions every agent can trigger or undergo. The distance qualifies the minimal distance, between the source and the target, beyond which the interaction cannot happen. Note degenerate interactions do not need a distance. The priority helps sorting the interactions when several are realisable at the same time step for a given agent. Every time step, each agent evaluates which interactions are possible with respect to its perception and depending on the preconditions and the limit distance of each interaction. Then, among the realisable interactions, the one with the highest priority is selected and triggered in the environment. As a consequence, the behaviour of an agent is reactive, e.g. it is not predefined but arises gradually along its interactions with the other agents. 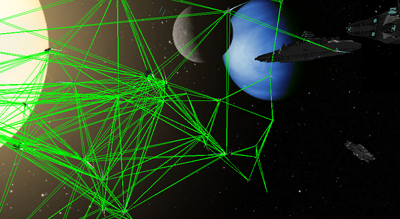 Yet, complex or collaborative behaviours can be designed in IODA, as the GALAXIAN simulation demonstrates. 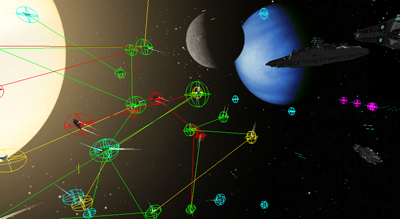 The resulting demonstrator features a space combat where units fight and collaborate to raid over enemy's frigates. IODA-Unity is a lightweight implementation enabling a substantial number of agents to operate smoothly, which eases its integration in a resource-intensive program like a 3d application. This is a web version of GALAXIAN, the Unity plugin is needed to play it. GALAXIAN was developed by Marc-Antoine Dupré (INRIA) and David Panzoli (CRIStAL/SMAC) for IRCICA Lille. The project was supported by the PIRVI platform.